novels (in html) verse (in html) other works (in html) links, miscellanea, &c.
of Classical learning which was a feature of his life and works. on Peacock to be held in Britain (or Australia) in 2010. Join the T. L. Peacock forum. biographical & critical excerpts by Dawson, Garnett, Priestley et al. or try the peacock information center. 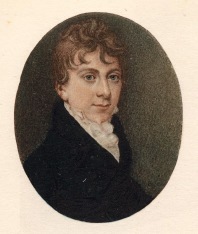 R. Jean when Peacock was eighteen years of age. maintained by Informal in Hobart, Tasmania. "The world is a stage, and life is a farce, and he that laughs most has most profit of the performance." —Brother Michael in Maid Marian, Chap. XVI. © 1998–2003 The Thomas Love Peacock Society. these pages for academic purposes is given provided that full acknowledgement of the source be supplied.